Great businesses aren’t easy to build, but what’s often harder to sustain their greatness over time. The same is true for our incomes. Perhaps you’re lucky enough to have built some nice streams of cash flow. At this point, many people would sit back, relax, and let the money roll in, when in fact they should actually be on the lookout for the next big threat. With that much money at stake, you’re bound to face a lot of competition. In his most recent book, Jim Collins talks about how mighty companies have fallen…and what we can learn from it. Specifically, he emphasizes the importance of staying flexible. Keep on your toes and be willing to adapt. Here are some stories of companies that fell apart due to their unwillingness to change with the times…and how an up-and-coming firm took advantage of the opportunity. Sixty years ago, the Great Atlantic and Pacific Tea Company (commonly known as A&P) was one of the largest and most profitable companies in the United States. 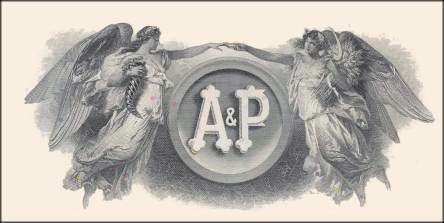 At the height of its power, A&P was the largest retail organization in the world, with a large network of local grocery stores all over the country. For several decades, the “local store” business model had served A&P well. Americans had suffered through a depression and two world wars, and were perfectly content with having a few low-cost choices. But in the 1950s, things started changing. All of a sudden, Americans had more money to spend. The old culture of frugality was out. Americans wanted more than just a few varieties of food in their local store; instead, they wanted a place where they could buy everything from food supplements to toothpaste to peanut butter. In essence, they wanted a “mega-store” to cater to their increased consumption. A&P realized that things were changing. They decided to test the waters by opening up a new store called the Golden Key. The Golden Key was a separate brand that allowed A&P to experiment with new ideas: they gave store managers more freedom to choose a wide variety of products and move towards a “one stop shop” business model. The result: increased customer satisfaction. Clearly, A&P’s experiment had given them the data they needed to reinvent their business. All they had to do was execute. But A&P refused to adapt, even though they knew that their old business model was dying. They closed the Golden Key and instead tried to compete on price. This led to profit margins declining even further, which crippled the company’s ability to grow. Meanwhile, competitors like Kroger’s department stores were embracing the new “superstore” business model. Like A&P, Kroger had conducted a number of experiments to discover these new consumer preferences. But unlike A&P, Kroger actually had the courage to take action. They systematically eliminated or changed every single store that didn’t fit into the business model of the future. Kroger's willingness to adapt paid spectacular dividends – for 25 years, Kroger’s stock performed at ten times that of the market. Meanwhile, A&P kept limping along, and its stock price declined for several decades. Even today, the company is unprofitable. Remember Poloroids? Those little cameras that would magically print out a picture for you right after you took it? In 1937, a chemistry student at Harvard named Edwin Land was researching an emerging technology called polarization. Through this research, he found that polarization could be used to instantly develop photographs; instead of having to wait for a few days, people could get their photos right away. He quickly realized that this would revolutionize the photograph industry and dropped out of school to start Poloroid Corporation. Poloroid’s “instant cameras” were a huge success. People loved getting their pictures right away. For the next several decades, Poloroid Corporation was one of the largest electronics retailers in the United States. The company just kept growing and growing…until the digital age. All of a sudden, people were able to take pictures electronically. They could instantly see how the picture had turned out, and could easily share them with their friends and family via e-mail. Why would you need instant pictures if you could see them immediately and print them at your leisure? Plus, users wouldn’t have to spend money on expensive camera film. Digital photos were clearly the future, and Poloroid had the resources and trusted brand to become a major player in this emerging market. But they refused to adapt. They ignored the new technologies and continued churning out their classic cameras. Throughout the nineties, Poloroid kept losing market share, until finally in 2001, they were forced to declare bankruptcy. Even through bankruptcy, Poloroid kept manufacturing and selling their outdated products. It was only in 2008 that they finally decided to completely shut down this obsolete line of business. The year was 1985. The personal computer was rapidly become a lucrative new business. Companies like Apple, IBM, and Atari Computer were making big moves to become major players. It was an exciting time for anyone in technology. But even though they were growing, Apple and IBM were running scared – all because of a wildly profitable company called Commodore Computers. Commodore originally started out as a calculator manufacturer. In the early 1980s, they released the Commodore 64, which quickly became a huge hit. Between 1983 and 1986, the Commodore 64 sold more than two million units every year – somewhere between thirty to forty percent of the total market. The company seemed like an unstoppable force. Ten years later, Commodore declared bankruptcy. What happened? Commodore’s early success was in producing a computer that everyone could afford. What they failed to realize was that as technology advanced, computers would become more affordable in general. The old “low-quality, low-price” business model was dying. The other thing was that the market for software was on the rise – everything from word processing programs to video games. PC companies needed to work with software companies to make sure their new machines were compatible with the most popular software applications. But Commodore refused to adapt. They figured that their technology and business model were so strong that nothing could ever threaten them. They refused to forge partnerships and market their products to new customers. As a result, they started losing market share to Apple and IBM. By the early 1990s, no one was using the outdated Commodore machines. Pretty soon, the company was bleeding money. In 1994, they finally decided to throw in the towel. It’s sad that for all of their huge contributions to the industry, Commodore computers is nothing but a footnote in the history of the personal computer. Categorized under: Increasing Profits, Making Decisions.